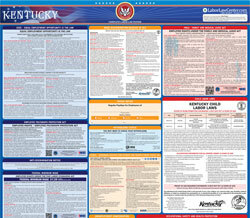 The Workers' Compensation Posting Notice is a workers compensation law poster by the Kentucky Labor Cabinet. This is a mandatory posting for all employers in Kentucky, and businesses who fail to comply may be subject to fines or sanctions. It appears you don't have a PDF plugin for this browser. Please see the link below to download kentucky-workers-comp-posting-notice-english.pdf. Chapter 342). Conspicuous posting of this Notice is required by law. furnished by your employer or its insurance carrier. injury, or last payment of temporary total disability benefits. INJURIES SO THAT TIMELY REPORT CAN BE MADE AS REQUIRED BY LAW.